Dr. Vijay Sinha is one of the best Nephrologists in Sector-128, Noida. He has been a practicing Nephrologist for 12 years. He has completed DNB (Nephrology), MD - Internal Medicine . You can consult Dr. Vijay Sinha at Jaypee Hospital in Sector-128, Noida. 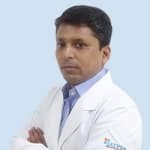 Book an appointment online with Dr. Vijay Sinha on Lybrate.com. Lybrate.com has a number of highly qualified Nephrologists in India. You will find Nephrologists with more than 42 years of experience on Lybrate.com. You can find Nephrologists online in Noida and from across India. View the profile of medical specialists and their reviews from other patients to make an informed decision. Hi , Recently I got to know that I have a stone of 7.7 mm in my right kidney. So what kind of medicine I should go for it? Homeopathic or allopathic My family wants to eradicate this as soon as possible. So which treatment will be more effective and less time taking? Thank you. My ultrasonography report is showing left ureter mildly dilated, it's done for 2 times and same results were shown but no stone was observed, Problem is from around last 4 years I feel gas in my left stomach i.e. In the pipeline between lung to near till urinary bladder, and my digestion is poor I am 24 years old ,my weight is around 12 kg less, immune system is weak ,most importantly I am facing breathing problem many time nose is choked up. Also I have been an addict of masturbation for yeas so there is little weakness in reproduction system i.e. In genital and testicles ,when I do massage I feel good for one or two days, are both problem connected. Take asokarishtam and dasamoolarishtam with jeerakdyarishtam mixed 30 ml daily twice morning and evening after food. Take for one month and give feedback. My aunt is suffering from kidney stones? What we should do to eradicate the kidney stones? Hi dear, welcome to lybrate. Stones remedy ------------ you should take care of diet. Do not take non veg and fried foods. -add plenty of fresh clean and healthy water -add sufficient vegetables/ fruits to daily diet. -avoid, if any ----------------------------------- - best way at present is -u purchase from some tibetan vaid expert in your area -- tibetan pathrihar course- -a tibetan remedy--1-months for complete cure- and get rid off stones in a short period- if you want to avoid surgery/ lithotripsy etc. At later stage. 100%- results/ cure- a little costly. ----------------------------- for the time being, you can start with;- tab cystone-1-1 with hot kulthi dal water-- 7 days. Hi, I am 16 years old and I don't know what I have. In my urinalysis, I have >50 RBC in my urine. What does it means? It means there is blood in your urine. U need to do further to know the exact cause of this bleeding as well as from where it is coming. Sir which food is avoid to reduce creatinine and uric acid name a tablet to reduce creatinine my creatinine level is just below normal level but my foot is swelling.Please advise. Can a 6 mm stone be flushed in urine m poor no money for surgery or treat meant can someone suggest me something that could help the stone pass in urine. Use safest and effective Homeopathy. Take Berberis 200 globules / pills twice a day so stone will either pass out or reduce in size soon. Consult privately to inform usg reports ,for any query ,advice. Take care. Sir I have 2 stones in junction left side of 8 mm & 5 mm. Due to these stones my urine comes with very slow speed. Pls suggest ayurvedic and homeopathy medicine. Take a berberis vulgaris q 8 drops in one cup water 2 times / day for 15 days. After 15 days revert me for further treatment. Drink water 10 glass / day. Doctor I have burning micturition for 3 weeks and I went nearby Hosp for my copper t removal so I have done pap smear, hvs ,urine culture . Others are normal but result of pap smear shows inflammatory smear .what does it means. Inflammation means a process of increased circulation locally with cellular proliferation due to some cause. The cervix from where the pap smear has been taken is showing this process. There is no mention of cellular anaplasia or hyperchromatic nuclei in your question which for the time being means there is no evidence of cancerous process in the cervix of uterus. She is 35, presently suffering with lower back ache in spine, aslo have 3 mm stone in kidney. Since when are you having this pain? What r other symptoms that you r experiencing? By doing what like walking, exertion, eating or empty stomach- it increases or decreases in intensity. For how much time the pain remains? Is there stiffness also? How is your appetite? Are you constipated? I need to know more to be able to make diagnosis. U need to do X-ray of lumbar spines. Try a few basic exercises to stretch and strengthen your back and supporting muscles. Repeat each exercise a few times, then increase the number of repetitions as the exercise gets easier Lie on your back with your knees bent and your feet flat on the floor (A). Using both hands, pull up one knee and press it to your chest (B). Tighten your abdominals and press your spine to the floor. Hold for 5 seconds. Return to the starting position (A) and repeat with the opposite leg (C). Return to the starting position and then repeat with both legs at the same time (D). Repeat each stretch two to three times — preferably once in the morning and once at night. 2. Lower back rotational stretch Lie on your back with your knees bent and your feet flat on the floor (A). Keeping your shoulders firmly on the floor, roll your bent knees to one side (B). Hold for five to 10 seconds. Return to the starting position (C). Repeat on the opposite side (D). Repeat each stretch two to three times — preferably once in the morning and once at night. 3. Lower back flexibility exercise Lie on your back with your knees bent and your feet flat on the floor (A). Tighten your abdominal muscles so your stomach pulls away from your waistband (B). Hold for five seconds and then relax. Flatten your back, pulling your bellybutton toward the floor (C). Hold for five seconds and then relax. Repeat. Start with five repetitions each day and gradually work up to 30. 4. Bridge exercise Lie on your back with your knees bent and your feet flat on the floor (A). Keeping your shoulders and head relaxed on the floor, tighten your abdominal and gluteal muscles. Then raise your hips to form a straight line from your knees to your shoulders (B). Try to hold the position long enough to complete three deep breaths. Return to the starting position (C). Repeat. Start with five repetitions each day and gradually work up to 30. 5. Cat stretch Position yourself on your hands and knees (A). Slowly arch your back, as if you're pulling your abdomen up toward the ceiling (B). Then slowly let your back and abdomen sag toward the floor (C). Return to the starting position (A). Repeat three to five times twice a day. 6. Seated lower back rotational stretch Sit on an armless chair or a stool. Cross your right leg over your left leg. Bracing your left elbow against the outside of your right knee, twist and stretch to the side (A). Hold for 10 seconds. Repeat on the opposite side (B). Repeat this stretch three to five times on each side twice a day. 7. Shoulder blade squeeze Sit on an armless chair or a stool (A). While maintaining good posture, pull your shoulder blades together (B). Hold for five seconds and then relax. Repeat three to five times twice a day. For this homeopathic treatment is very effective For more details you can consult me.